Rooms and suites designed to the highest standard. The renovation of Derby Manor was based on the original Edwardian architecture. As an Edwardian building, the whole ethos of the renovation was to reflect Edwardian design principles, whilst providing a contemporary twist. Derby Manor, once used by Lord Derby when visiting Bournemouth, endeavors to reflect his keen interest in horses and horse racing. It is hoped that the design provides a warm, relaxing and inviting atmosphere to all visitors. Our Rooms and Suites at The Derby Manor have been specially designed with your comfort in mind, a place to relax and unwind, then start your following day with our Full Continental Breakfast. 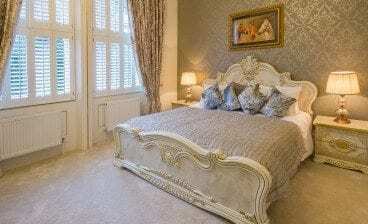 Choice of luxury Derby Manor Rooms.